February is a style minefield. Your heart says “nearly spring” but your head says “no babe, it’s -1 degrees outside”. We’re all craving some spring style, lighter nights and brighter colours but unfortunately, we have to realise that we live in the beautiful Kingdom that is United and it’s going to be damn cold until at least late April. Here are five style picks that can help update your look without turning you into a teeny little icicle. We’ve all agreed that a jacket is still 100% necessary to keep warm but why not make it a cute one? Topshop are killing it at the moment with their camo pieces and this Raw Hem Shacket is the perfect piece to rock now with jeans and boots and then take into actual spring and summer to wear with cute dresses! The khaki jacket was all over our Instagram feeds and the high street last summer and I think that I personally wore mine at least 3 times a week so this camo jacket is the step up in style from that. Plus you can grab 10% off with your UNiDAYS discount which is a fine little somethin’ somethin’ to brighten up your day. I’m not a dressy-dress kinda gal. Even though I love fashion I definitely freak out when it comes to dresses and I would definitely be rocking a suit in those all-important ‘dressy’ situations like posh dinners, graduations and weddings (guest side obv). This is why I’ve been absolutely crushing on blogger babe Laura’s style over LFW recently. I mean, this striped suit from New Look is incredible, isn’t it? Grab the blazer here and the trousers here. A suit is a great investment because they’re 1) an outfit in itself 2) a new pair of trousers and 3) a new jacket. So you have at least 3 new outfits coming out of one purchase of under £40 from New Look. Praise the fashion gods! Ok, bear with me. White boots are the new black boots. Don’t lie to me and tell me that you don’t have a fail-safe pair of black boots, gal. I know you do. These killer Missguided boots will go with so many outfits and will brighten up your look for under £40 again. Be brave, rock some white booties but don’t forget to keep those wet-wipes in your bag for cleanups to keep them bright and beautiful! 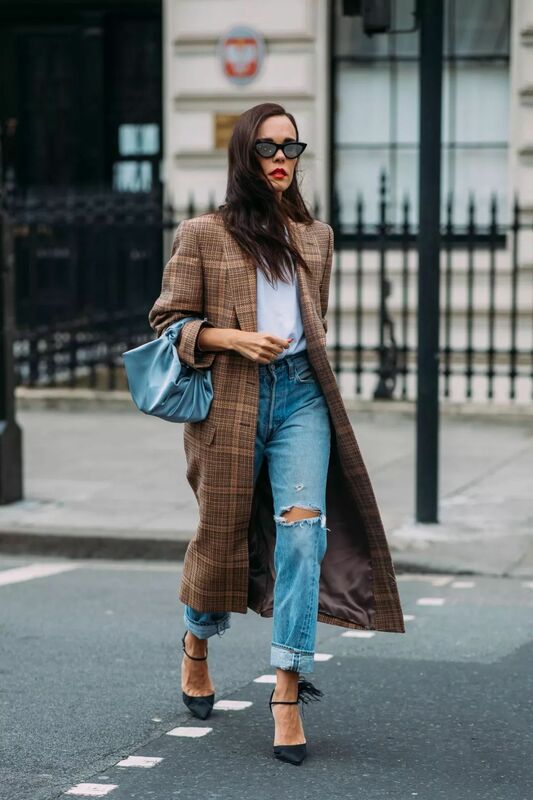 Need some outfit inspo? How about blue jeans and a red and white striped top? Cute and Parisian - everything I aim for in life. Don’t let anyone tell you that baker boy caps are over. You still need to keep your head warm, those greasy roots at bay AND look cute af, right? I know I do. I’m still trying to make it happen. Thanks to Lily Pebbles for still rocking this easy as pie trend and looking killer in it. Keepin’ cosy just got cooler. You can pick them up from basically any high street shop still so they’re definitely not going to be disappearing from our wardrobes anytime soon. Checked coats and blazers are still huge news and I don’t think they’ll be going anywhere soon so I would still recommend investing in a piece if you’ve been umming and ahhing about it! They were a trend piece but I think they’re timeless enough to last a good few seasons. Invest in a light checked coat or a blazer in grey or beige to keep it spring-like. I’m loving this Miss Selfridge number, the white buttons give it a less wintery edge which is fab for transitioning through the seasons. Layer these pieces over roll neck jumpers now and over white tees paired with a denim mini when the sunshine finally comes out! Oh, and don’t forget about the all-year-round ASOS 10% off discount that you can use on this beaut to get it even cheaper.